Great bustard news a good omen for county? THERE’S been some wonderful nature news this week after it has been confirmed that the symbol of Wiltshire, the great bustard, has bred in the county for the first time since 1816. The bustards were driven out by agricultural change and hunting but the birds have never been forgotten and still used to turn up in the county as migrants in the nineteenth century. The Great Bustard Trust, which was started by former Wiltshire policeman David Waters was set up to bring the county bird back home and this is a major achievement. 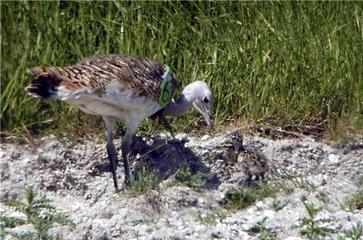 Three chicks have been seen tended by two mothers at secret breeding locations on Salisbury Plain. “David Waters has overcome numerous hurdles to bring us to this position and as a fellow moonraker I have nothing but admiration for what he has achieved,” said Steve Dancey. * The last bustard chick in Wiltshire was ridden down and killed at Great Hinton in 1816 although some continued to breed in Suffolk until the 1830s. The birds last visited Wiltshire in the 1880s when four of a party of eight were shot - since then only stuffed examples have been visible with one in a case at the members' room in County Hall and a family group on display at Salisbury Museum. Pictured: One of the Wiltshire birds with two chicks.